“If you practice yoga once a week, you will change your mind. Two months ago, we welcomed our son into the world. I feel immensely thankful that my once struggling body was able to grow, deliver and nurse this beautiful baby boy and I am so so proud to be his mom. After the first hectic weeks of getting to know each other, adjusting to the new family dynamics and eating waaaaay too much cookies to stop the hunger from breastfeeding around the clock, I feel like taking back control over my days and slowly starting to rebuild my physical strength. But thats easier said than done when you’re functioning on five hours of fragmented sleep or less and hardly have time to eat, drink or take a shower without someone asking for your attention. So it got me thinking: what’s the smallest action I can do that will have a big impact on my health? Then I remembered Sarah Peck’s 100 days of YogaGrams project, in which she helped people learn a new yoga move in 5 minutes a day. It sparked an idea: doing one yoga pose a day during the month of June. Depending on the type of yoga you do, yoga can be a restorative practice, a way to both relax and rebuild your health at the same time. I’ve been doing yoga on and off for the past four years, and I love the positive effects it has on my wellbeing. Through a flow of different poses, you work on your strength and flexibility, while also letting go of tension in your body. Focusing on your breathing helps you connect to your body, clear your mind and get centered on frantic days. And a big bonus point for people with chronic illness: yoga can be adapted to your fitness level, making it a doable activity even when your energy and mobility are limited. But don’t just take my word for it; seasoned yogis can tell you at least 25 reasons why you should do yoga every day. By making yoga a daily practice it becomes a part of your daily life, making it more likely you’ll stick to the routine over time. And little things done consistently can make a big difference in the long run. It’s doable. As a mom of a newborn and a toddler, I have very little time or energy to do anything but tend to the needs of my family. Getting through the days on 5 hours of sleep or less is challenging enough as it is, without adding an exhausting exercise regimen to the mix. Plus, you can do your yoga pose wherever, whenever – no fancy equipment or elaborative sessions needed. It’s a gentle activity yet still helps to rebuild my core strength, flexibility and mental focus. My only self-imposed rule is doing at least one yoga pose or sequence a day. There’s no monthly plan with set poses for me to follow. I will choose the pose that feels right for me at that time, depending on my body’s needs, and the practice can last as long or short as I feel like. If I truly can’t find a moment to practice yoga – and yes, even five minutes to myself can be ambitious at the moment – then a breathing exercise, meditation or a mindful body scan during daily activities count too. 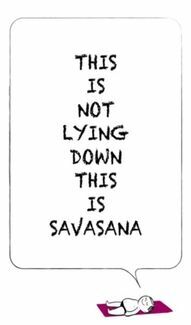 And if all else fails, there’s always lying in savasana before bedtime. To make it easier to stick to the challenge, I’m making ‘if-then’ plans and setting daily reminders on my phone. I’ve also compiled a list of yoga poses I can do, so I’m not lost for inspiration when I do have a quiet moment to practice yoga. To get started, I’ll be focusing on the postnatal core strength exercises for new moms from Well+Good over the next few days. Who’s The One Yoga Pose A Day Challenge For? Anyone with little time on their hands who’s looking to boost their health and happiness in a small, doable way. People with chronic illness who want to improve their overall wellbeing without pushing themselves too hard and risk post-exertion malaise. New moms. Yoga strengthens your core and pelvic floor muscles, helps you relax and connect to your (changed) body in a nonjudgmental, no-pressure way. Will you join me with your own yoga challenge during June? You can share your process on Instagram by using the tags #myhealthsessions and #oneyogaposeadaychallenge or leaving a comment below! Disclaimer: I’m far from an expert on yoga and how to perform the poses correctly. So if you’d like to follow along on Facebook or Instagram for your own 30 day yoga challenge, please turn to seasoned yogis such as Tara Stiles or Yoga with Adriene for tutorials. If you’re suffering from chronic illness but still would like to give gentle exercise a try, check out Yoga, My Bed and M.E. by Donna Owens for suitable exercises.